Financial Bin founder David T. Domzalski announced today that his media company is looking for business owners who want to share their story. Did you start a company? Did you pour years of blood, sweat, and tears into making it a success? If so, we want to hear from you! Maybe you tried to start a business and failed. Was the government there to help you out or give you your investment back? Probably not. We want to hear those stories too. “We Built It” has become the battle cry for those out there outraged by the President’s assertion that entrepreneurs and business owners owe something to the government for helping them succeed. What could be more ridiculous? We want to share your story with the world and let business bashers like the President know how job creation really works. Last year, Financial Bin released its first book, Entrepreneur Intervention: Triumphs & Failures of Entrepreneurs. To spread awareness of the book and your business’s creation story, we want to hear from all of you out there who “built it.” Get your story to us today! Email David at david@financialbin.com. We can’t wait to hear from you! Entrepreneur Intervention: Triumphs & Failures of Entrepreneurs is a compilation of stories from 28 entrepreneurs and small business owners — people who actually BUILT their OWN companies. At a time when economic uncertainty and unemployment numbers fill the headlines, we all need something to lift us up. That is what this book is about. Financial Bin has accumulated the stories of 28 remarkable individuals. These entrepreneurs share their triumphs and failures with you as you embark on a quest to figure out your own life. Maybe you just lost your job. Maybe you just graduated college with no job prospects and massive student loan debt. Maybe you feel it is time to be your own boss. Whatever your reason, “Entrepreneur Intervention” can help you along the way. Open your mind and allow yourself to be inspired by true success. The book is available on Amazon in paperback. It is also available for your Amazon Kindle, Barnes & Noble Nook, iPad, and Sony Reader. 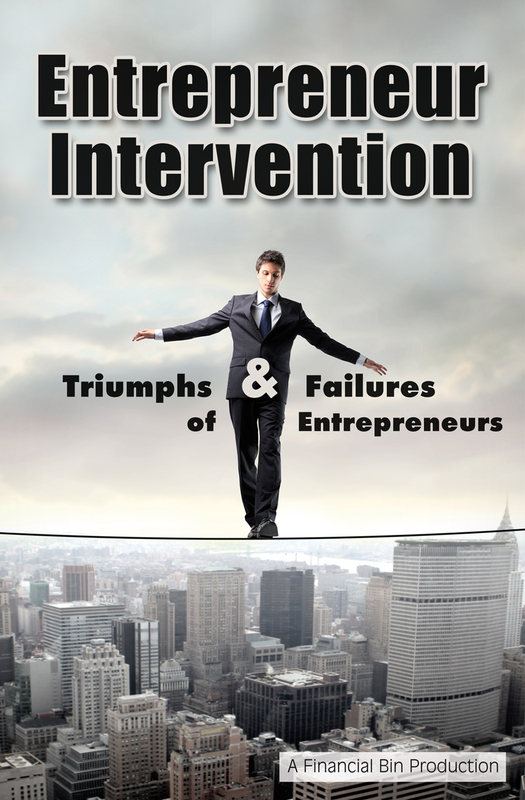 Please find more information about Entrepreneur Intervention and pick up your copy HERE.